Japan has a very rich textile history, with the kimono being a major focus of interest and artistic expression. 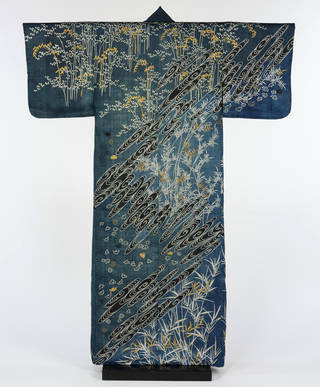 Meaning 'the thing worn', the term kimono was first adopted in the mid-19th century. Originally worn by commoners, or as an undergarment by the aristocracy, from the 16th century kimono became the principal item of dress for all classes and both sexes. It is still an enduring symbol of traditional Japanese culture today. Kimono are simple, straight-seamed garments. They are worn wrapped left side over right and secured with a sash called an obi. The length of the garment can be altered by drawing up excess fabric under the obi. Other adjustments can be made to suit the wearer, such as pulling back the collar so that the nape of a woman's neck can be more sensuously revealed. The wrap style allows for ease of movement - a useful feature for a culture where many activities are performed while seated on the floor. The kimono is also well-suited to Japan's climate, with unlined kimono worn in the humid summers and multi-lined kimono worn in the winter. In kimono it is the pattern, rather than the cut of the garment, that is significant. Indications of social status, personal identity and cultural sensitivity are expressed through colour and decoration. Only the elite regularly wore luxurious kimono; the majority of people would only have worn silk garments on special occasions. The choice of obi and accessories, such as combs and pins worn in the hair, are also important. The images used on kimono often have complex levels of meaning. The most popular bird depicted on kimono is the crane. Believed to live for a thousand years and to inhabit the land of the immortals, it is a symbol of longevity and good fortune. 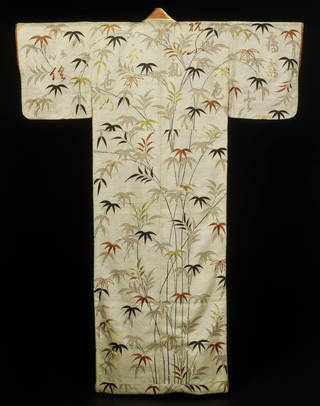 (Left) Kimono, Japan, early 19th - mid 20th century. Museum no. T.18-1963. © Victoria and Albert Museum, London. (Right) Detail Kimono, Japan, early 19th - mid 20th century. Museum no. T.18-1963. © Victoria and Albert Museum, London. Specific motifs were used to indicate virtues or attributes of the wearer, or relate to the season or occasion such as weddings and festivals where it bestows good fortune on the wearer. Colours also have strong metaphorical and cultural meanings. Dyes are seen to embody the spirit of the plants from which they are extracted. Any medicinal property is also believed to be transferred to the coloured cloth. Blue, for example, derives from indigo (ai), which is used to treat bites and stings, so wearing blue fabric is thought to serve as a repellent to snakes and insects. The introduction of the concept of the five elements from China to Japan in the 6th century gave colours a cosmological dimension. Fire, water, earth, wood and metal are associated with particular directions, seasons, virtues and colours. Black, for example, corresponds to water, north, Winter and wisdom. Colours also have strong poetic significance. Purple, for example, is a metaphor for undying love, the imagery deriving from the fact that gromwell (murasaki), the plant used to create the dye, has very long roots. 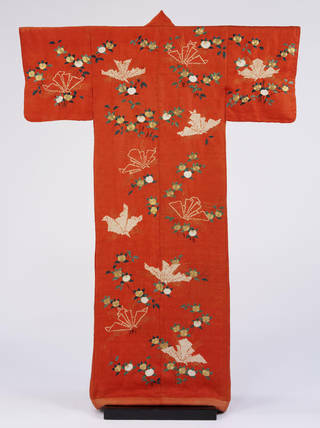 Perhaps the most popular colour for kimono is red, derived from safflower (benibana). Red signifies youthful glamour and allure, and so is suitable for the garments of young women. 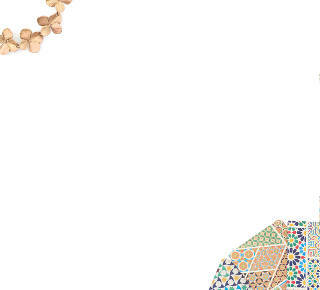 The richest source for kimono motifs comes from the natural world. Flowers such as peonies, wisteria, bush clover and hollyhocks frequently appear on garments. Many of them, for example cherry blossom, chrysanthemums and maple leaves, have a seasonal significance. Pine, bamboo and plum are known collectively as the Three Friends of Winter (shōchikubai), and are symbols of longevity, perseverance and renewal. The pine tree is an evergreen and lives for many years, bamboo bends in the wind but never breaks, and the plum is the first tree to blossom each year. The plum is particularly favoured for winter kimono as its use suggests that spring is not far away. 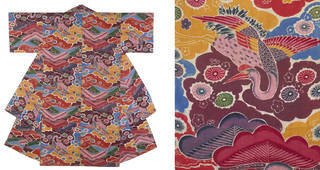 Birds, animals, butterflies and dragonflies also appear on kimono, along with other motifs drawn from the natural world such as water, snow and clouds. On some kimono whole landscapes of mountains and streams are depicted. Elements of the natural world that appear on kimono usually have strong poetic associations, while more complex landscape scenes often refer to particular stories drawn either from classical literature or popular myths. Although such stories invariably involved people, it is relatively unusual to find human figures depicted on kimono. Instead there are objects which suggest their presence or recent departure, a pair of dropped fans, for example, alluding to lovers disturbed. 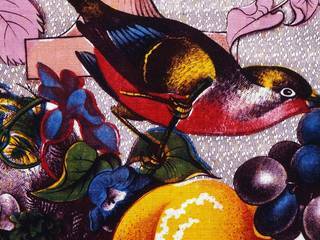 From the early 20th century increasingly graphic imagery was used on kimono. 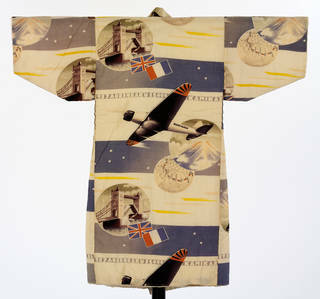 On garments for young boys, in particular, symbols representing Japan's modernity and progression are depicted - cars, trains, aeroplanes and skyscrapers. In the 1930s such motifs became increasingly nationalistic and militaristic.